These sort of things disgust me, but I’m posting it anyway. Four cups of chopped rhubarb, 1 cup of fresh cicadas, washed and any hard parts removed; 1&1/3 cups white sugar, 6 tablespoons all-purpose flour, 1tablespoon butter, and a 9-inch double crust pie crust. You’ll find the rest of the recipe in this article from the Arizona Republic: Answering bug query is easy as pie. Jake Crider takes a bite of a chocolate-covered cicadas. He has kept a container of pre-cooked, frozen periodical cicadas that he harvested last year. 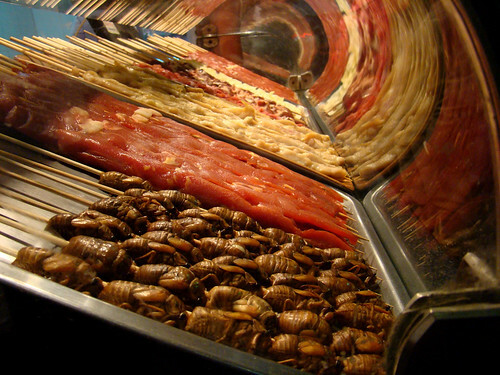 Deep End Dining has a post about cicada soup, including a picture of a big steaming bowl of them. Photos: An awesome series of photos from Arthur Guilani. In isolated pockets across the Washington area, periodical cicadas have begun to emerge in heavy numbers, the silent beginning of an infestation of black-bodied, red-eyed insects that is going to get a lot more intense and a lot more noisy before it ends next month. Monitor article Invasion of the teenage insects. Every 17 years they emerge. To some, it’s a dream come true: an opportunity to see nature in full-blown action. To others it’s a waking nightmare: the invasion of the really big bugs with the big red eyes.